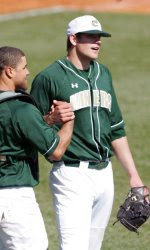 The Charlotte 49ers' 13-1 win over St. Bonaventure on Thursday assures the 49ers a spot in the 2009 Atlantic 10 Conference baseball tournament. Charlotte (31-19, 15-10) got eight strong innings from sophomore starter Joe Yermal, who improved to 8-2 on the season and struck out a career-high seven batters. Charlotte has finished in the top four all three previous seasons in the Atlantic 10, with a pair of titles in the past two years, and a fourth-place finish in 2006. Charlotte is currently fourth in the league standings. The teams meet at noon Friday in Game 2 of the three-game series.